$49 17.5" x 14.5" x 1"
These paintings are special. They are painted on ceramic material. After painting, the pictures were put into the kiln and were burned with high temperature. This process makes the color last forever. 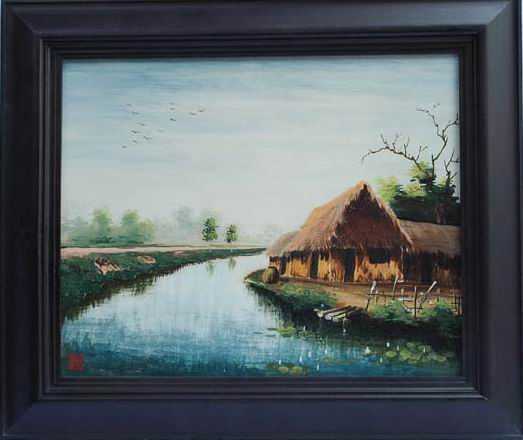 These paintings are from Bat Trang, a village located in the south east of Ha Noi, about 10 km along the dike of the Red river. This is a pottery village with a half-millennium historic development. Since the 15th century, the village of Bat Trang has been famous for its pottery. Some decades recently, the vitality of this village is still blown up by the thousands of pottery-kiln on fire day and night. Pottery from Bat Trang was either plain white or decorated with blue, green, dark yellow, or pale brown glaze. The most popular designs involve a combination of white and deep shiny cobalt blue. Most of the pictures are typical painting of Bat Trang’s style with the traditional colors: white and blue. Each painting features the old streets of Hanoi as they appeared from different views. The houses are built in the early 20th century. Many of them have since disappeared. Bat Trang is famous with the paintings of vietnamese traditional folk themes using the tons of colors of Dong Ho Painting style. There are also various paintings of contemporary style that the artists use brushes and non-traditional colors on a hand made Bat Trang’s traditional ceramic tile, makes the ceramic paintings really stand out and different from other kinds of paintings. You will also find some special ceramic paintings in this page. The beauty of the paintings is deep inside the ceramic title and covered by a very light, fine glaze (or broken glaze looks like an ancient artifact.) The pictures are carved, engraved on the titles, then cover by color and glaze. The figure and colors of these paintings are really beautiful and unique. You will see a variety of ceramic paintings in this page, but if you look closely, each painting has its own character. some of them are smooth, some of them have interesting surface texture. Each picture is hand made completely by the Bat Trang’s people. There is a significant characteristic of these paintings that their colors never fade. Each painting is a beautiful evidence of the combination of the long history of Vietnamese traditional folk art and Bat Trang people's talents. Each painting includes the hand made frame shown and mounting brackets and is ready to hang on the wall. The small standard painting each weigh over one pound, and the big one each weigh from 5 to 7 pounds.